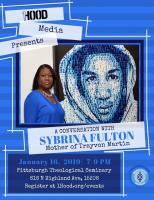 Join us in a conversation with Trayvon Martin's mother, Sybrina Fulton. Since her son's murder, Sybrina has stood on the front lines as an advocate for social justice and the elimination of police brutality. Exeperience a first-hand account of her courageous journey and what she is doing to ensure that others do not suffer from racial and social injustice. Doors open at 7. Talk begins at 7:30.